About HM Home | About Us | Opportunities | Sponsorships | Contact Us! Handmade Men is a passionate project that helps connect the best artisans, teachers, and curators with the men who seek their work. Handmade, DIY, one-of-a-kind, and one-off pieces are quickly becoming the trend in every market. Men all over the world are stepping out of big box stores and away from import designers in favor of real artisans who create with their hands, their hearts, and their dedication. Handmade Men finds creative and magnetic ways to present handmade, one-of-a-kind, natural, sustainable, and one-off items to the male market through a diligent process of hand selection and artist/studio interviews. We speak in advance with every artist we feature, and never feature products without first talking to their creator(s). As time goes on, the HM prediction is that more and more people will start investing their support and money with local and handmade artisans – and we want to be there while it happens. The handmade revolution is real – and the implications of putting our resources back in the hands and in the workshops of real people who are working hard to make a difference in the world one stitch, turn, word, nail, line, and sound at a time. If you’re an artist who creates for men, a man who loves being the only guy on the block with the one of a kind handmade piece you own, or someone who loves men’s style and finding great gifts for guys, this site is for you! Throughout each week we spotlight artists, works, products, and specials from across the artisan world – and we share lots of great information about grooming, health, abundance, wisdom, and laughter along the way. 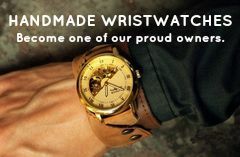 Be part of the Handmade Men revolution… A one-of-a-kind lifestyle! Handmade Men Is A One Man Project! Charlie Fitzgerald is a pro blogger and passionate Etsy seller. Charlie started Handmade Men in 2012 and works hard to promote crafty artists and shops who make for men, great handmade men’s products, and the best men’s wisdom in the world. If you’re interested in being part of the Handmade Men team, send us a note here! Learn how Handmade Men can put your shop, work, or products in the spotlight! Click <HERE> to see all of our partnership options! We do not accept payment or product in exchange for positive reviews. We do accept payment for ad placement. We are an actively pro-people website. We do not discriminate against anyone based on gender identity, sexual orientation, race, creed, or lifestyle. We understand that gender is not always as easy to wrap up in a single term as it may seem, so we welcome everyone who feels drawn to this site to enjoy it to the fullest no matter what their gender identification may be. We work hard to support those artisans and shops who hold equality-based views and create for the sake of making the world a better place – free from judgment, hate, bigotry, sexism, homophobia, ableism, classism, or other harmful approaches.